The Economic and Financial Crimes Commission, in Thursday, described as false and misleading the United States of America's report, which claimed that Nigeria's anti-graft war agencies were not doing enough to stop corruption and were driven by a climate of impunity and selective prosecution. While dismissing the US report as untenable, the EFCC boasted that it had done so well in the fight against corruption that other nations of the world were highly appreciative of its effort in curtailing corruption and had sought collaboration with it to move their countries' operations forward. According to the agency, it made a remarkable progress in the areas of convictions, recovery of looted assets and the forfeiture of cash and property to the government. The commission said: "Indeed, the US report's portrayal of the work of the EFCC, which is replete with inaccurate information, is worrisome considering the close working relationship between the Commission and some US entities. 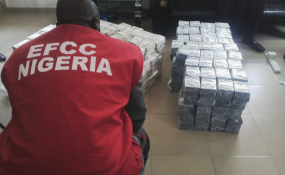 "Agencies of the US Government, especially the Department of Justice and the Federal Bureau of Investigation (FBI), US Securities and Exchange Commission, Post and Telecommunications Department and the Financial Crimes Enforcement Network (FinCEN) have very strong collaboration with the EFCC in the delicate task of tracing and seizing stolen assets but stashed abroad by rogue Nigerian officials. These US agencies are familiar with the determination and passion with which the Commission is going about the fight against corruption. "From the foregoing, it is clear that the report authored by the American agency has done a great disservice to the work of the EFCC in particular and the fight against corruption under the leadership of President Buhari, an administration that is globally acknowledged for the enormous political will it has brought to the fight against corruption in Nigeria. "We are conscious of our past when previous government officials were involved in corrupt practices with impunity but that history is being re-written by this government and the commission. "The rest of Africa appreciates the administration's work in terms of fighting corruption in Nigeria which was the impetus behind the designation of President Buhari as the Anti- Corruption Champion early last year by the African Union (AU). In that capacity, President Buhari is saddled with the responsibility of leading the rest of Africa out of the corruption quagmire. "At the level of the EFCC, the Acting Chairman of the commission, Mr. Ibrahim Magu, attained the leadership of the Heads of Anti- Corruption Agencies in Commonwealth Africa (HACACA) in May 2018. This was based on his antecedents and acknowledged track records in the fight against corruption. "There can be no greater validation of the profound impact of the fight against corruption in Nigeria in the last four years than these milestone achievements. But for those who cannot see any good in what Nigeria is doing, it is better to leave the country alone than distract it with bogus reports," EFCC said. It will be recalled that the United States Department of Bureau of Democracy, Human Rights and Labour on March 17, 2019 published a report entitled: "Nigeria: Massive, Pervasive Corruption At All Levels of Govt". The Bureau, in its Country Reports on Human Rights Practices for 2018, among other things, stated that "there is a climate of impunity in the President Muhammadu Buhari government that allows officials to engage in corrupt practices with a sense of exemption from punishment".